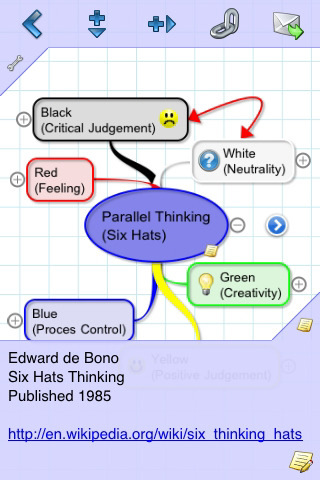 iThoughts is a mind mapping tool for the iPhone. If you have an iPad then check out iThoughtsHD. It enables you to ‘see the big picture’ – freeing you to concentrate on how your thoughts and ideas relate to each other. • Wirelessly upload/download mind maps from your Mac, Windows or Linux system using your favourite web browser. • Icons and coloured topics. • Cut, copy, paste, move and merge the topics. • Edit in landscape and portrait mode. • Download maps directly from the Internet. • Attach notes to topics – with hyperlinks to phone numbers, web sites, e-mail addresses and other iThoughts maps. • Share maps with friends and colleagues via Flash enabled browser. • Auto align and arrange topics relative to each other – automatically if desired. • Integrated with box.net online collaboration service.